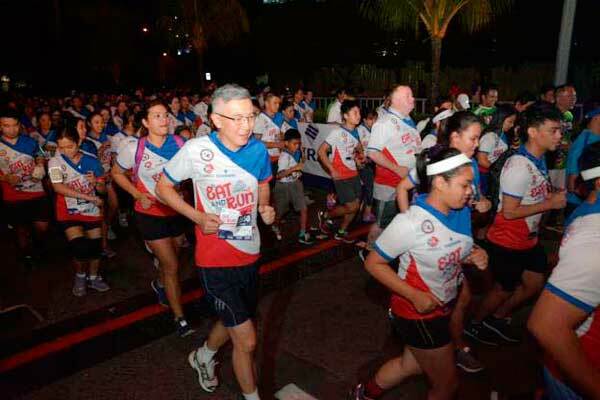 About 200 employees of Chevron Philippines Inc., marketer of Caltex fuels and lubricants, and Chevron Holdings Inc. put on their running shoes last March 3 for the 8th AmCham ScholaRUN. The fun run is an annual fund-raising initiative of the American Chamber of Commerce Foundation Philippines Inc. to help send students to school was held at the Central Park, SM Seaside Complex in Pasay City. Chevon Philippines employees take part in the 8th AmCham ScholaRUN. More than 4,000 employees from AmCham member companies, many of whom arrived as early as 5AM joined the run, filled the seaside complex, and showed their enthusiasm in supporting the scholarship program. The participants chose from various categories to join in—three-kilometer run, five-kilometer run and a 10-kilometer run. “We’re glad to be institutionalizing ScholaRUN as part of our employee program, promoting wellness and, at the same time, supporting a good cause, which is to fund the scholarship program of the foundation. We’re glad to be supporting this annual endeavor of AmCham as it not only benefits the less fortunate but also gives us the opportunity to be part of a community that helps those in need,” Manager for Policy Government and Public Affairs Atty. Raissa Bautista shared. AmCham Foundation has been fueling up learning for many years now, providing scholarships to high school, vocational and college students since 1986. Through its member companies, the organization sponsors tuition fees, uniforms, subsistence allowances, school supplies, project fees, and even on-the-job training and employment assistance. To date, the program has helped more than 2,000 youth scholars graduate and secure good employment. A number of former scholars are now employed at reputable Filipino and multinational companies. “We’re really pleased with the participant turnout. We exceeded 4,200 runners, that’s the highest ever and a lot more than the number we had last year. This year has also been excitingly different as we managed to cook up a new twist for the run. Seeing all the happy faces of the employees from AmCham member companies together with their families and friends really puts the icing on the cake. We’re already looking forward to the next one,” AmCham Foundation President Ed Feist shared. CPI has worked with AmCham for many other social investment programs that give back to the community. Through these programs, future leaders of society are given the chance to further their dreams by being provided access to livelihood training and education.